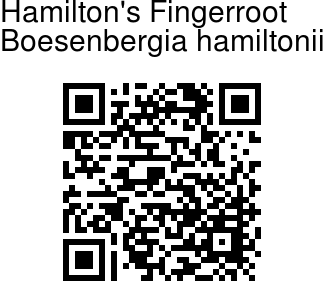 Hamilton's Fingerroot is a newly identified plant which was mistakenly believed to be something else. It is named in honour of Francis Buchanan Hamilton (1762-1829) a Scottish surgeon and botanist. Flowers are 4-6 per inflorescence, up to about 15 cm long. Calyx tubular, 2-2.4 x 0.5 cm, white, translucent, hairless, tip tri-toothed. Flower tube is about 9-12 cm long, 3-4 mm wide at the base, white tinged with pink, hairless externally and internally, flower lobes oblong, about 4 x 1.2 cm, white, hairless, margins involute; Lip is slightly saccate, elongate, 5-5.5 cm long, 3.5-4 cm wide, margins slightly crisped, crinkled, tip notched, white, throat centre red, dotted with white showing thru as dots, lip entirely pink to the tip; lateral staminodes are obovate, 1.8 x 1.5 cm, white. Stamens are 12-14 mm long. Fruit is a capsule, cylindrical, asymmetrical, 2 cm long, 1 cm wide, calyx and floral tube remain partially intact, white, hairless, surface smooth. Inflorescence arise from the root, about 3-10 per pseudostem, up to about 19 cm long (including flower-cluster-stalk), flower-cluster-stalk 5-9 × 0.8 cm, white, hairless, basal sheaths 1-2, 3.5-4.5 x 1-1.5 cm, white, hairless; spike horn-shaped, 8-11 × 2 cm. Bracts are boat-shaped, 4-6, to about 9 cm, green and white, sometimes red, each bract enclosing one flower; bracteole boat-shaped about 5-6 x 0.4 cm, white, translucent, hairless, open to the base, tip 2-toothed. Leaves are 3-6 per pseudostem; leaf-stalk 8-26 cm, deeply channelled, light green, hairless. Leaves are elliptical, 34-44 x 15-19 cm, plicate, ventrally dark green, hairless, dorsally lighter green, hairless with a few hairs on the midrib, base rounded to heart-shaped, tip pointed. It is a deciduous herb up to 1 m tall; rhizome up to about 2.3 cm diameter. fibrous roots about 45-50 x 0.1 cm, yellow-white, with many secondary root hairs. Pseudostem up to about 30 cm long, composed of leaf sheaths. 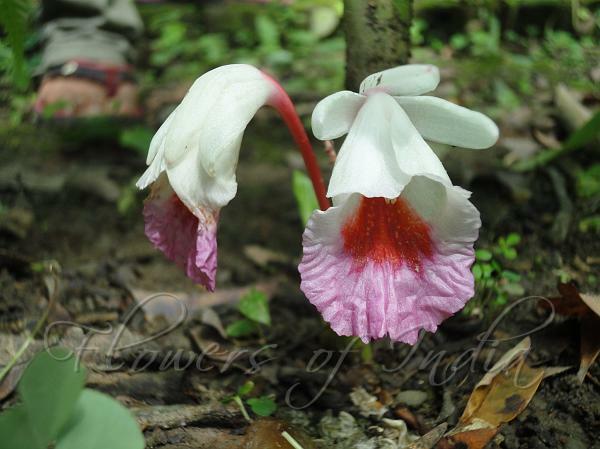 Hamilton's Fingerroot is found in NE India, at altitudes up to 1850 m. Flowering: May-September. Identification credit: Zhu Renbin Photographed in Imphal, Manipur.